Should the state further cloak police conduct with secrecy? Body-worn cameras will make police cases, not legal cases against them. Riding a wave of demands for police reform, we’re actually about to sacrifice good governance and civil rights. 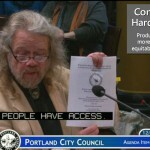 On 10 December 2014, Consult Hardesty partners derailed an attempt by the Portland Police Bureau to slip a nearly million-dollar spending proposal past our City Council. (Testimony on Item 1276 here. Jo Ann at 166:33, Roger David at 218:40.) Pretending to merely solicit information, PPB intended to commit to purchasing body-worn cameras. We provided the above screen shot of the proposed bid, scheduled to drop an hour or so five days following the close of the meeting. Saltzman was well aware that police agencies throughout Washington State had put their body-worn camera programs on hold. Silicon Forest software geeks had exercised their legal right to see the public record. Eric Rachner won more than $60,000 in settlements after suing Seattle PD for lying, and withholding video of his bogus arrest for playing Frisbee. He reinvested the money, formed the Center for Open Policing (SEACOP), and the nonprofit won $23,000 after Washington State Patrol lied about dashcam video of an aberrant traffic stop. “Through their shrewd use of Washington’s Public Records Act, the two Seattle residents are now the closest thing the city has to a civilian police-oversight board,” reported the Washington Post. The idea of police oversight is anathema to Portland City Council. They fear it. The City paused in its desire to grab a share of Obama’s $75,000,000 for body-worn cameras … to lend its lobbyists to those of the immensely profitable Taser and law enforcement proponents, and carve loopholes in Oregon’s vaunted open records laws. (Taser stands implicated in hiring police commanders to hustle suspicious no-bid contracts in problem agencies such as Albuquerque PD.) Taser isn’t just targeting Oregon: “Lawmakers in at least fifteen states have introduced bills to exempt video recordings of police encounters with citizens from state public records laws, or to limit what can be made public,” reports the Guardian. The plan is not to improve transparency in policing. America now enters an era when police have been exposed for failing to police themselves. Should the state act to stymie emerging, citizen-based accountability structures? We think not. The People should have continued access to records they’ve paid to collect. Illegal police conduct should not lead to suppressed access to information. In his 180 seconds of testimony, partner Roger David Hardesty (right) offered detailed recommendations which might precede any plan to introduce cameras. (Five months later, no implementation plan has been submitted for public review.) He also submitted several documents outlining policy decisions which would logically precede investment in hardware. Adopted policies could be expected to describe intended functionality, prior to soliciting for bids. Of course, Consult Hardesty advocated for transparency and greater public involvement, even citing a District of Columbia Police Complaints Board: “To ensure the most effective policy, the needs and concerns of the many stakeholders throughout the District should be assessed and incorporated to the maximum extent possible.” Rising, nationwide demands for procedural justice require such. America now enters an era when local authority can no longer be allowed to structurally shield police conduct from public review. Public (and even judicial) oversight of police is anathema to Portland City Council. Consult Hardesty has long contended that poor outcomes in justice delivery require the City to stop allowing police to exonerate themselves. Our Mayor, acting as a Police Commissioner, wants police made responsible for overseeing video records they produce. We say checks and balances hold high value. An external body should be responsible for record retention, and culling through the evidence for ‘service improvement opportunities’ and outright illegal acts. House Bill 2571A would prevent such review. Without accountability systems, cameras will not deter police misconduct. The City of Portland exonerated themselves in the stomping death of James Chasse. Only when his heir’s lawyers enhanced jailhouse video – obtained through a public information request – were they able to provide evidence of PPB officers’ false testimony. Video evidence of the Keaton Otis homicide has never been analyzed, or set beside a false police narrative. Not until a community has a few years of successfully disciplining cops based on citizen-supplied video, and sustained improvements to training, should cameras be adopted. Cops lie, people die. Officers begin testimony long before a case gets to court. Reviewing police beatings on YouTube, it’s not uncommon to see ‘peace officers’ punch downed suspects while exclaiming, “Stop resisting!” Unless an independent entity – outside policing – assesses officer conduct, we’ll see a whole new body of performance art: Acting and Directing With Police Cameras. It was by surreptitious digital audio recordings at roll call, that NYPD Officer Adrian Schoolcraft exposed illegal stop ‘n frisk. For cameras to deter illegal conduct, they’d be on from the beginning of officer performance of public duty. Had we heard the H.E.A.T. unit colluding over coffee prior to intervention on Keaton Otis, we’d be able to prove their violent, racist intent in his lynching. Allowing cops to decide when to record, based on their beliefs, is troublesome. Oregon state law allows cops to merely state they were in fear for their life, to give DAs an excuse not to put a case to trial. We introduced legislation to change that standard, to let juries assess whether a reasonable person would believe killer cops. The bill died in the Senate Judiciary Committee. Dozens of other inherent failures require consideration far deeper than Portland City Council is capable of. The cloak they put on sacrificing Oregon’s history of unfettered access to the public record, civil rights concerns for victims, does have merit. In the midst of nationwide initiative to restore trust in police (who’ve been caught locally, intimidating the City’s fake oversight board), some concern should anticipate the effect on folks who consider giving ‘on camera’ witness statements or evidentiary leads. Will cameras suppress public involvement? Failing to draft policy around the use of body-worn cameras has one payoff for opponents of police reform. Legislators aren’t prompted to think about the end result they bargain for. They busily assure law enforcement that they’ll keep secret public employees’ work products … yet have no conceptualization as to how the technology will be employed. For more than a decade the City of Portland has refused to negotiate reforms in their police union contract, to adopt best practices their own consultants advocate. Portland police, after a lethal encounter, are accorded forty-eight hours to cook up a story before going on the record. California Assembly Bill 66 would give officers the right to watch video from body-cameras … before composing after-incident reports. We can expect the City to bargain for the Portland Police Association to have the same protection. It’s a pattern of endorsing what we call concocting ‘plausible, but untrue’ accounts of police behavior. The City believes exonerating officers protects them from financial risk. Tell lawmakers you value freedom of information. Consult Hardesty volunteered a considerable amount of time, producing a body of work for City Council to review in a broader consideration of policy … instead of simply rubber-stamping the cops’ hardware request. We submitted them to the Council Clerk (although Commissioner Amanda Fritz snapped up the screen capture of the pending contract). Listening ad nauseum to Capt. Scruggs, Council refused to allow Roger David 120 additional seconds to more fully describe the half-dozen documents and speak further to the merits of their consideration. He simply entered them into an historic record of the proceedings. It’s usual for the Auditor to post documents submitted during public testimony, along with the minutes for the Council meeting. Our contributions are not there. UPDATE: We did find them, floating in hyperspace: here. Most folks conceptually link police body-worn cameras to improved transparency. This is a false assumption. In the very midst of public debate on their adoption, the City suppressed buried evidence which refuted their contentions. You are being asked to trade access to public records for false assurance of security from police violence. It also forms a pattern of seeming to address community needs, while violating their true interests. Our calls on the U.S. Department of Justice, to eliminate racial profiling and bring relief from police killings of unarmed African Americans, did not produce those results. In their Findings, the Civil Rights Division declared race outside the scope of their investigation. A resulting plea deal offered the City of Portland, Oregon expanded police powers. It diminished citizen participation in what the DoJ termed an already ‘self-defeating accountability system’ (pg. 27 in the Findings). See our post, The Trojan Horse of Police Reform. In this testimony before Senate Judiciary, Mayor/ Police Commissioner Hales falsely portrays the police homicide of Merle Mikal Hatch. Hatch was unarmed and taunting cops to “come play” outside a hospital when he was killed. The citizen-supplied video evidence is that of false risk assessment by police. Hatch was undoubtedly in mental health crisis, and member of a protected group for which the Fed’s plea deal was supposed to offer relief. It’s time to end the lies. We need legislation which will hold authority accountable, and increase the chances that they will adhere to the truth. We need not now expand their power to deceive. UPDATE: We’ve been asked to ferret out from our files whatever of our testimony remains. Click here for demands we assembled for coalition partners Right to the City. Click here for the ten points Roger David refers to in his testimony. 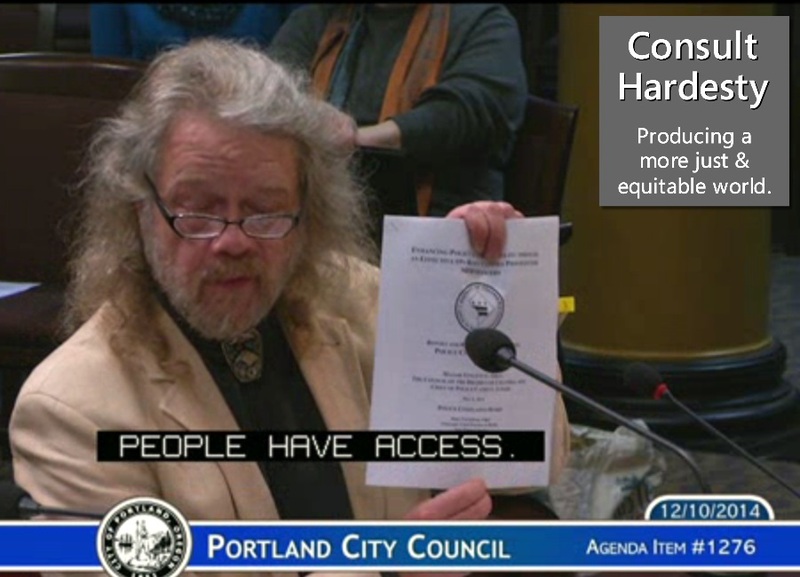 UPDATE: Carefully reviewing Council minutes for 10 December, as Council is congratulating itself for overseeing a competitive bid process, Lt. Scruggs testifies, “I’ve been to a conference and looked at the other vendors that are out there …” NOTE: one, heretofore unnamed vendor is in PPB sights. ‘Others’ are out there. This is the second time Consult Hardesty testimony led to Council tabling a police contract Chief Reese set before them under false pretenses. Both partners testified on 26 September 2012, opposing multi-year contract renewal for Dr. David Corey’s delivery of psych eval services, in screening new police hires. Mayor Adams realized it was not a short ‘top up’ of money due, as PPB contended … but another long-term commitment. Our testimony here. I am not sorry I skipped the story about Seattle (and then read it at your prompting), Mr Hardesty, but I am delighted to have had the opportunity to read of your hard-earned successes. My hat’s off to you and your Consultancy.